Cross-County Trail (CCT) in Lorton— Fairfax County is proposing the design and construction of a new multi-use trail to provide non-motorized access between the Occoquan Regional Park and the Laurel Hill Greenway, both of which are portions of the CCT. The trail connects users with the historic Workhouse Arts Center, a program of the Lorton Arts Foundation (LAF), which is listed on the National Register of Historic Places, and enhances an already significant historic destination. Mason Neck Trail—Construction of a multi-use trail to provide non-motorized access to the historic, environmental and recreational resources of Pohick Bay Regional Park, the Meadowood Recreation Area, Gunston Hall Plantation, Mason Neck State Park and the Elisabeth Hartwell Mason Neck National Wildlife Refuge. Phase III of the Georgetown Pike Walkway Project—The project will be constructed at the western end of Georgetown Pike, connecting the Seneca Shopping Center and site of the historic Salem Baptist Church with the western terminus of Georgetown Pike Trail Project – Phase 2. See information provided to the Board at today's meeting, Endorsement of the FY 2014 Virginia Department of Transportation’s Transportation Alternatives Grant Applications staring on page 189. What projects should Fairfax County consider for next years program? FABB has conducted bike light giveaways for the past several years. We provide free front and rear lights to cyclists, many of whom depend on bicycles as their main form of transportation. This year we received a very generous grant from the 495 Express Lanes Community Grant Program to conduct another free bike light campaign. Thanks to Transurban for supporting our work. This winter we've been giving out lights to unlit cyclists we encounter on the roads and trails and now we have the resources to purchase more lights. 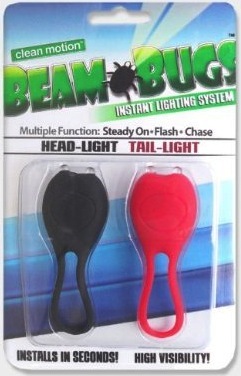 We are using Beam Bug lights which are much simpler to install than the lights we used previously. We will also be handing out highly reflective pants straps to cyclists and others. We often encounter walkers and runners at night who have no reflective gear and the straps help make them more visible. A special thanks to bikes@vienna who give us a good price on the lights. 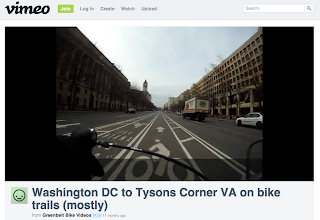 I happened across a video of a ride from Pennsylvania Ave. in DC to Tysons, mostly using trails, posted on The WashCycle. It was recorded about a year ago by Greenbelt Bike Videos. I'm very familiar with most of this route which primarily consists of the Custis Trail to W&OD Trail. Part of the last section to Tysons is on a route that's new to me, the Beltway crossing on Barbour Rd. Where the W&OD Trail crosses Shreve Lane the rider takes a right and quick left to follow Pinecastle Rd to Barbour Rd which crosses the Beltway. The rider continues on Barbour then turns left on Idylwood Rd. I am often harassed along this stretch of Idylwood Rd where drivers seem very aggressive and intolerant of bicyclists. The rider then stops at the intersection of Idyl Lane and Idylwood Rd (see the sign for Idylwood Towers in the background) to check directions. After a short pause they head down Idyl Lane only to turn around and climb back up to Idylwood Rd, a fairly steep climb, and turns right on Idylwood. This is a really bad section that's narrow with lots of aggressive traffic. We've lobbied for better bike facilities here. There is funding for paved shoulders but there are many physical challenges to implementation. Bicycles May Use Full Lane signs were installed by VDOT last year. The rider continues on this bad stretch of Idylwood toward Gallows Rd. There's lots of traffic and many close passes. Surprisingly the rider makes a U-turn and passes through this same section back to a left on Idyl Lane, a relatively bike-friendly road. Wayfinding signs indicating good routes to major destinations are definitely needed in Fairfax. At Route 7 the rider turns left on the service road headed west toward Tysons. They then make their way through the parking lots and services roads parallel to Route 7, a route identified on the Tysons Master Plan as a possible bike route given a few improvements. Where the service road ends the rider follows the sidewalk past Marshall High School. Past Marshall HS there is a service road that could have been an alternative. At Lisle Ave the rider crosses Route 7 and rides to the Westin Hotel. While the Westin may have a Tysons address, it's on the periphery. To reach Tysons one would have to continue on Route 7 and cross the Beltway, which in the past has been one of the more dangerous places to ride. A cyclist was killed riding there in 2008 and a pedestrian was killed in the same location in 2010. Since the Route 7 bridge was rebuilt there is now a wide side path that cyclists can use. It is possible to ride to Tysons and it's gradually getting better. With over 100,000 people working there, direct, safe bike routes with good wayfinding signs, are desperately needed. On January 22 WABA released their first mobile app, The WABA Crash Help Kit for iPhone and Android which allows cyclists to enter pertinent information regarding a bike crash. See the WABA blog post about the app, the GGW post, and one from DCist (thanks to WashCycle for the references). As you can see from the image on the right, the app contains 9 main sections: Report Accident, Modify Old Report, Personal Information, Emergency Information, Safety Tips, The Bike Laws (DC only), Emergency Light, Expense Tracker, and About WABA. Use the Washington Area Bicyclist Association mobile app to accurately record information at the scene of a bicycle crash and reference current Washington, D.C. bike laws. 1. Record important crash data using your phone's camera, voice recorder, and an in-app text notepad and drawing pad. 2. Automatically add your street location to crash reports using GPS. 3. Email crash reports to yourself and WABA, or provide a crash report to a victim as a witness. 4. Look up D.C.'s bicycling laws and common enforcement errors. 5. Call 911, a taxi or car service. 6. Store personal information, like ownership records for multiple bicycles. 7. Locate a nearby hospital, police station or bike shop. 8. Use an emergency flashlight. 9. Learn more about WABA. The main section is Report Accident. You can enter Driver Information, Witness Information (2 witnesses), Injured Information, and Police Information. You can also enter the crash location using the phone's GPS. You can then enter Road Condition, Light Condition, and Weather Condition. You can enter Personal and Bicycle information, and record various media: photos, audio, notes, and drawings. 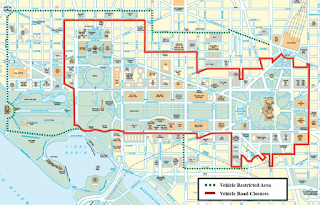 The bike laws currently only cover DC. WABA wants to include MD and VA laws but needs to get them into the proper format. According to Shane Farthing of WABA, "Adding VA and MD laws to the app would require a review of our existing web content for correctness and completeness, as well as substantial reworking to fit the app format." There's also the complication of dealing with laws in local jurisdictions. The next version of the Bike Laws section will likely only include VA and MD statewide laws. Can you report a crash in Fairfax? Absolutely. According to Shane, "We want all the reports we can get regionwide." I've downloaded the app and hope that I don't ever have to use it. If I do, I'll be able to gather all the info needed to document the crash. Thanks to WABA for making this resource available. Ride Richmond is promoting Bicycle Action Day on Tuesday, January 29. According to the flier posted on the Ride Richmond site, the purpose is to "Petition in support of favorable cycling laws." Riders will gather at 10:30am at the VCU Compass. At 10:45 the group will ride to the Capitol for a rally at 11:00. On the Action Day page is a list of bicycle-related legislation being proposed this year in Virginia, along with a number of general talking points in support of bicycling. 1. Roads are for people, not just people in cars. The streetplan of Richmond (and Virginia) was well established long before the first automobile appeared here. Most local roads in Richmond predate the arrival of automobiles. 2. Virginia law gives cyclists all the rights of operators of motor vehicles, except on limited access highways. Virginia Code Section 46.2-800 et seq. 3. Cyclists pay more than their share for roads, because virtually all cyclists also own cars and pay gas tax, and also pay general taxes. Contrary to what many seem to assume, our local roads are not fully paid for, (if at all), by car taxes or gasoline taxes. Given the vanishingly small impact of cyclists on road maintenance, one can easily argue that cyclists who ride their bikes instead of driving their cars are subsidizing those who choose only to drive. It’s historical fact that the “Good Roads Movement” which led to widespread paving of roads, was started by cyclists. 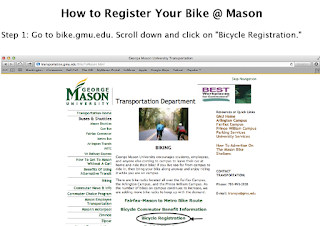 Mason has a bicycle registration program that allows anyone who is affiliated with this campus and has a G number (it's our personal identifier with the school) to register their bike and receive a free OnGuard U-Lock ($40 value), a personalized registration sticker, and a free VDOT guide to rules of the road for cyclists. I've made this little three-step, how-to guide for anyone who would like to register. More info can be found at bike.gmu.edu. "Following too closely; passing other vehicles. Includes bicycles, electric personal assistive mobility devices, electric power-assisted bicycles, and mopeds among vehicles that the driver of a motor vehicle shall not follow more closely than is reasonable. The bill also increases from two feet to three feet the minimum clearance between a passing vehicle and an overtaken bicycle, electric personal assistive mobility device, electric power-assisted bicycle, moped, animal, or animal-drawn vehicle." The next step is approval by the full Senate. See the VBF reports on the bill. Thanks to VBF for monitoring progress of the bill and speaking out in support during the committee hearing. 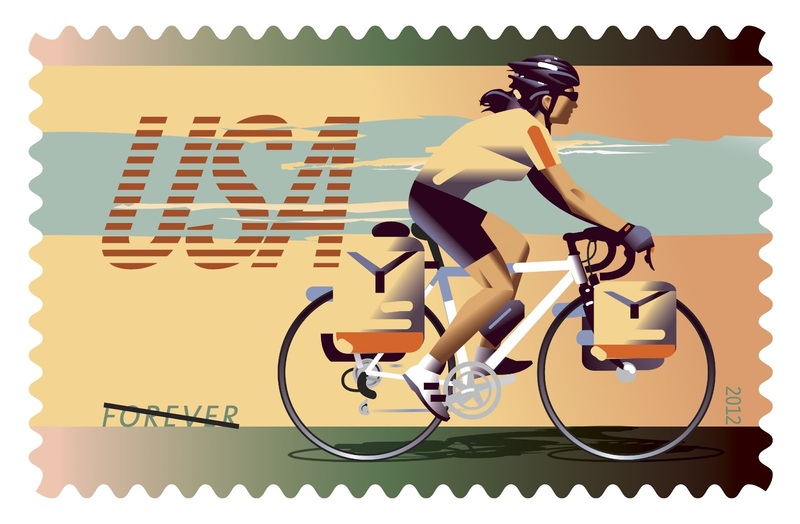 Time to buy Bicycling Forever stamps? Joining Amato in dedicating the stamps were Minneapolis Mayor R.T. Rybak and Angela Keegan Benson, assistant news director, WCCO-TV. The bill that would help prevent cyclists from being injured when a car door is suddenly opened, bringing Virginia in line with most other states, passed the Virginia Senate by a vote of 23-17. The bill, SB 736, is sponsored by NoVa Senator Chap Peterson. See the Post article about the bill, Fairfax senator's 'asinine' bill to protect cyclists from 'dooring' passes Virginia Senate easily. The bill introduced by state Sen. Chap Petersen, of the ever-shifting Fairfax City and County district, to prohibit the “dooring” of cyclistspassed the Virginia Senate by a 23-17 vote Tuesday. Last week the Senate Transportation Committee approved it 7-6. The bill instructs car drivers and passengers — as laws do in at least 40 states and D.C. — not to open their doors in the path of cyclists or any oncoming traffic. With no violation currently on Virginia books, injured cyclists often are rejected for medical coverage by insurance companies because no fault was assessed. The bill was angrily denounced as an “asinine measure” and “embarrassing” by a Norfolk columnist. Biking is one of the best ways to get to the Inauguration on Monday. Metro will be very crowded and traffic on the roads will be a mess. You have many options when traveling by bike. Transportation Nation has published Your Guide to Biking to the Inauguration. In the Burke Patch article written by Beth Lawton, Presidential Inauguration 2013: How to Bike to the Inauguration, FABB's Alan Young, WABA President Mark Blacknell, WABA's Greg Billing, and DCDOT's John Lisle provide some tips as well. Bicycles are not allowed inside the security perimeter as indicated on the map above. There are two perimeters indicated by a dashed green line and inside that, by a red line. It appears bikes are allowed inside the area indicated in green, but be prepared for a long walk. Bike parking will be available on a first come, first served basis at 16th and I, just north of Lafayette Square. You'll need to arrive early and bring your own lock. I was interviewed recently by Kytja Weir of the Washington Examiner: THE 3 MINUTE INTERVIEW: Bruce Wright. She was interested in learning more about the challenges of winter riding. It's a brief article in which I touch on a few of the major issues. It's always been puzzling to me why so many people put away their bikes for the winter when I think it's a great time to ride. When there's no snow or ice on the road, riding can be very pleasant. The trails, especially the W&OD Trail, are mostly empty. It does get dark early and good lights are needed, especially out here in the suburbs. It would also be nice if NVRPA opened up the W&OD Trail to nighttime riding which we've heard they plan to do in the near future. In the interview I discuss some ways to cope with the cold. The photo on the right was submitted to the Examiner but didn't make it into the article. It was taken by Shannon Ayres. He's a photographer and bike commuter. He's is doing a series of photos of local bike commuters. The photo was taken on the W&OD Trail near Newton Square. Update 18Jan2013 - The article appeared in print in today's Examiner. We've mentioned several times that the STOP signs on the W&OD Trail road crossings are not enforceable. The latest incident we discussed was about a ticket issued to a cyclist on the Trail in Falls Church. That ticket was dismissed on the recommendation of the Commonwealth Attorney. SB 959 is a bill making it's way through the Virginia legislature that "Allows local governing bodies to adopt ordinances requiring users of shared-use paths to stop before crossing highways at marked crosswalks." According to the Virginia Bicycling Federation, yesterday the bill made it out of the Senate Transportation Committee. The bill would in effect make the W&OD Trail STOP signs enforceable. As we've stated earlier, we think police use the STOP signs as a way of harassing cyclists during "sting" operations along the Trail. We think the current law, which is being modified by the proposed bill, is sufficient to handle situations where a trail crosses a road with a crosswalk. Pedestrians, and cyclists, must not "enter or cross an intersection in disregard of approaching traffic" and motorists "shall yield the right-of-way to any pedestrian crossing such highway." We can't dart out into the crosswalk, but once in the crosswalk motorists must yield. The STOP signs just complicate the situation and have been used as an excuse by motorists not to stop for bicyclists in the crosswalk. The bill was sponsored by Senator Favola based on a request by the Loudoun Sheriff Department. This is the same department that ticketed cyclists for not putting a foot down at an intersection along the route of the Reston Century this year. Loudoun sheriffs are also notorious for targeting cyclists on the MS 150 in 2009. A representative from the department spoke in support of the bill. Thankfully a rep from NVRPA spoke out against the bill. We have contacted Senator Favola's office and stated our concerns. We're hoping she will abandon the bill. HB 1950 is the VA House bill that would modify the current bill on following too closely so that it would apply to bicyclists. Thanks to all the cyclists who responded to alerts sent out by FABB, WABA, and others to ask Del. Barbara Comstock to support the bill. She reported today that she voted in favor of the bill and that it passed unanimously in the House Transportation Subcommittee. This is a great sign of bi-partisan support and bodes well for the bill once it reaches the House floor. Your support was key in getting this bill past. Thanks to Del. Comstock for her support. Update: We've heard that there was a minor change in the bill that would could effectively make it illegal for bicyclists to follow each other closely. We'll post more news as we learn the details. Update 2: The similar Senate bill, SB 1060, does not contain this language. It also changes the vehicle passing distance from two feet to three feet. If this bill passes, then the two bills will be reconciled and there's a chance the language from HB 1950 could be changed. VDOT just announced the awarding of several new $1,000 Quick Start Mini-grants. Congratulations to Laurel Ridge Elementary School located south of GMU. They received a grant to purchase bike racks to "Promote Biking to School." However, Fairfax County Public School staff have said they would provide bike racks to any school that needed them. We plan to find out details. Congratulations also to Cunningham Park Elementary School in Vienna. They received funds for "Walking Wednesdays, Bike Rodeo, and Pedestrian and Bike Safety." Let's hope we'll be seeing more kids walking and biking to school this year. Kelley, our FABB member who has been working on developing historical rides in Fairfax County, has broken the highway markers out into two main categories. The first is based on history. If you're interested in developing a route based on particular time frames (pre-Civil War, Civil War, 20th Century, African American history), she is happy to send you the information that way. However, where Kelley (and FABB) need your help is in developing rides based on local information. 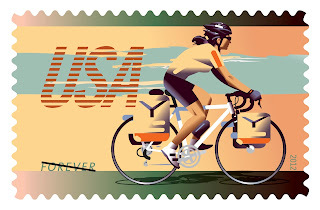 The historical markers put up by the state and county will be the framework, but your local stories will help connect them, and your local knowledge of riding conditions, paths, and streets is essential to making these rides accessible to all. If you live in any of the following areas and are interested in seeing what Kelley's doing, and offering your local knowledge, please e-mail us and she will get in touch with you. Do you live in another area? Are you interested in what your area might have? Contact us! Contact Del. Comstock to support "Following too closely" bill. Del. Alfonso Lopez, who represents the Seven Corners and Baileys Crossroads area in Fairfax County, has introduced HB 1950, Following too closely. The bill states that motorists shall not follow other vehicles, including bicycles, too closely. The bill will come before the 7-member House Transportation Subcommittee on Wednesday. Del. Barbara Comstock is the only Fairfax member on that committee. She voted against an identical bill last year. Please contact Del. Comstock, 804-698-1034, to ask her to support this bill. Some members of FABB discussed this issue with her at a recent town hall meeting and we hope she will support the bill this year. Your message to her could help get this bill passed. § 46.2-816. Following too closely. The driver of a motor vehicle shall not follow another motor vehicle, trailer, or semitrailer more closely than is reasonable and prudent, having due regard to the speed of both vehicles and the traffic on, and conditions of, the highway at the time." This would not prevent a cyclist from riding closely behind another cyclist in the common practice of drafting, as it only applies to drivers of "motor" vehicles. For more information on this bill read Following too closely talking points written by Allen Muchnick of Virginia Bicycling Federation from last year's session. HB 1950 contains the same wording. The 2013 session of the Virginia General Assembly is now underway and is scheduled to conclude on February 23. HB 1950 (Lopez), which would prohibit motorists from rear-ending bicyclists (i.e., following bicyclists "more closely than is reasonable and prudent"), may be heard by a 7-member House Transportation Subcommittee as early as 7 AM this Wednesday, January 16. Virginia is the only state that does not prohibit motorists from following bicyclists too closely, yet this simple and common-sense legislation has repeatedly been defeated by close subcommittee votes in the Virginia House of Delegates. Please email and/or call the Richmond offices of these legislators to respectfully ask, as your representatives on this subcommittee, that they support HB 1950 to better protect bicyclists from rear-end collisions. Reportedly, of the 10 bicyclists killed in Virginia traffic crashes in 2012, 8 had been rear-ended by motorists. You can also identify and contact your state legislators from the Who’s My Legislator page. Thank you for taking action to make bicycling safer in Virginia. Despite multiple requests to VDOT to provide a detour for the Fairfax County Parkway Trail between Route 50 and Fair Lakes Blvd, the trail is still closed with no detour provided. In an earlier FABB blog post we listed the VDOT policy for providing temporary access for trail users at construction site. Yesterday we rode south on the Parkway Trail from Reston and once again encountered the Trail Closed signs just south of Route 50. There were several bike tire tracks in the mud where other cyclists have tried to get through this area. We've pointed out to VDOT a possible detour through nearby neighborhood streets. We were told on Dec. 4 that VDOT project staff would be willing to sign the detour and they would look at the proposed route and get back to us in a day or so. We haven't heard anything since. We're preparing a letter to various local leaders protesting this closure. It's unacceptable on a major trail like the Parkway Trail. On the left is where we assume the new trail will be located, but it's likely still going to be several weeks before it's in place. In the meantime it's a disservice to trail users not to provide a detour. Virginia Gov. McDonnell recently announced his solution to the transportation funding problem: eliminate the gas tax. The Virginia gas tax, 17.5 cents, is one of the lowest in the nation and has not been raised since 1986. To think that the solution is to eliminate this tax and implement an increase in the sales tax is an odd choice. Eliminating the gas tax will take away one incentive to drive less. It will treat those who drive gas guzzling SUVs the same as drivers of lightweight fuel efficient cars. To make matters worse, the governor wants to penalize alternative fuel vehicle owners by implementing a surcharge of $100 per year. Raising the sales tax means that everyone will now pay for building and repairing roads they may not even use. Bicyclists and those who don't drive will pay the same as SUV drivers. The gas tax was never enough to cover the cost of building and repairing roads, especially here in Fairfax. All taxpayers currently fund these additional costs through transportation bonds and other local taxes. We should be raising the gas tax to reduce that imbalance, not eliminating it. One part of the plan that does make some sense: "Increase vehicle registration fees by $15 and dedicate the revenue to intercity passenger rail and transit." We would go further and dedicate a part of that $15 to funding bicycle and pedestrian projects. It's estimated that just under 10% of all trips are taken by walking and biking and yet only about 1% of transportation funds are devoted to those facilities. 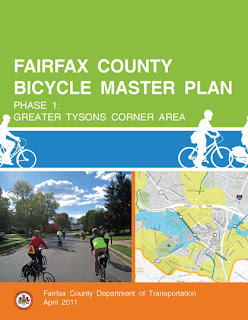 Over the past couple of years FABB has been working with Fairfax County to develop the Tysons and Countywide Bicycle Master Plans. Several FABB members served on the advisory committee and we attended all of the community and focus group meetings. The draft bike plan was delivered to the advisory committee and county in July. We understand that some changes have been made to both the plan text and maps, although the advisory committee has not met since the summer. The plan will be going before the Planning Commission and Board of Supervisors over the coming months. FABB will be meeting with Commission members and Supervisors to encourage them to pass the plan and provide funds for implementation. The following is a summary of the plan extracted from the July 13, 2012 draft. We'll be using this information, and any changes made since the July draft, to prepare briefing materials and to get the word out to the larger community about the plan. Meeting the needs of bicyclists today, while encouraging more people to bicycle in the future. Develop a connected physical network of existing and proposed on-street and off-street (shared use paths and trails) bicycling accommodations that will serve all bicyclists from 8 to 80+ years of age when cycling for recreation or transportation purposes. Provide guidance for the development of new facilities and accommodations and the upgrading of existing facilities such that shared-use paths, selected sidewalks, neighborhood streets, collector, arterial and primary roads will provide safe and comfortable bicycling route options that serve all communities and destinations. Increase bicycle use for transportation, especially for non-commute trips, which are about 75 percent of all trips. Establish and track annual progress towards bicycle travel demand and bicycle network supply goals identified in the Countywide Bicycle Master Plan. Increase actual bicycling safety and the perception of safety for bicycling on roads and trails in Fairfax County. Establish and track annual progress towards safety goals identified in the Countywide Bicycle Master Plan. Encourage healthy lifestyles and physical activity through regular bicycle use for transportation and recreation. Increase conservation of energy resources. Support congestion mitigation and emission reductions. Improve mobility and access for all transportation system users. Convert short (less than three miles) single-occupancy vehicle trips to bicycle trips. More fully integrate bicycle improvements into the planning and project development process. Improve overall bicycle safety, access and connectivity throughout the County and to adjacent counties. Foster the development of bike culture in Fairfax County. Make bicycle travel a viable transportation choice and thus expand the numbers and variety of people bicycling for transportation. The facility recommendations shown on the Bicycle Network maps generally represent the bicycle facility that should be installed if action to improve bicycling conditions is to be taken in the near term (within 10 years of Plan adoption). Many of these recommendations may remain applicable beyond that timeframe. Fairfax County will build upon and take full advantage of VDOT’s recently adopted Bicycle Policy Plan. To provide overall guidance regarding Network development, Fairfax County will follow the most current editions of the AASHTO Guide to the Planning and Design of Bicycle Facilities, and the Manual on Uniform Traffic Control Devices. Other important references include the National Association of City Transportation Officials (NACTO) Urban Bikeway Design Guide, VDOT’s 2011 MUTCD Supplement, and VDOT's Road Design Manual, Volume 1 Appendix A, Section A-5. Given County law that permits bicycling on all sidewalks and paths, it is understood that whether or not a sidewalk or path is considered part of the Bicycle Network, it likely will be used by children/youth bicyclists to get to and from school, and/or by other bicyclists as a link to the Network. As such, the owning agency or entity should be attentive to basic maintenance and its general condition. Every roadway development project and land development proffer should be evaluated for its contribution toward, or lack of contribution to, achieving the goal of creating a connected network that is safe and functional for bicyclists from ages 8 to 80+. New bicycle facility designs and treatments should be routinely considered and and used where appropriate; where roadway conditions and travel patterns warrant, formal experimentation should be undertaken when implementing new designs. While flexibility is needed in bikeway design, flexibility shall not be used by developers or transportation agencies for the purposes of providing “lowest cost” facilities at the expense of bicyclist safety and comfort and/or network continuity and connectivity. A FCDOT bikeway design exception policy should be established; the intent of which is to help the County provide safe and appropriate quality bicycle facilities at reasonable costs, while preserving opportunities to upgrade facilities in the future at the lowest additional cost. These recommendations are based on a planning level assessment of what facility is generally feasible, and what facility is optimal based upon road and traffic conditions and likely levels of bicycle usage. Other factors such as maintaining continuity of a single facility type through connecting road segments, whether or not the road segment is part of a longer route, and the types of destinations served also factored into the recommendation. In general, bicycle accommodation with some type of striping or markings (i.e. bike lanes, striped/paved shoulders, or shared lane markings in wide outside lanes) are preferred over unmarked wide outside lanes. At a minimum, buffered bike lanes or wide (6-10’) shoulders should be provided on Bicycle Network roads with heavy volumes and/or speed limits at or above 40 mph. On-street parking will not be over-supplied at the expense of an opportunity to provide appropriate/planned bicycle facilities. Facilities that require modification to on-street parking in residential areas should be vetted with the affected property owners. In almost all cases the bikeway recommendation requires only a reduction in capacity, not elimination of all on-street parking. Alternating the side with parking block-by-block can both calm traffic and ensure that inconvenience is not born solely by residents of one side of the street. Where short-term on-street parking is provided – Standard bike lanes or shared lane markings. Speed limit of 30 or 35 mph – Standard Bike lanes. Speed limit > 35 mph – Cycle tracks or buffered bike lanes. Continuous service roads with Standard bike lanes or shared lane markings. New, resurfaced, and reconstructed streets (collector and local) in revitalizing or urbanizing areas should have a speed limit of 20-30 mph and accommodate bicycles using shared roadways (without markings), shared lane markings, or standard bicycle lanes as is appropriate given their overall function in the Bicycle Network and roadway system. The County will continue to develop a system of signed bicycle routes; Phase 1 and 2 routes in the Tysons Corner area (see Tysons Bicycle Plan) and routes in McLean being of the highest priority. Future routes should be developed as conditions on roads and trails along the route are determined to be consistent enough to support a signed route. The GIS database of all trails in the county should be updated annually to include the trail owner and the agency responsible for maintenance for all trail segments. This database should include information about privately-owned trails that are open for public access, and the trail surface type, surface width and other information relevant to effective maintenance and management of a trail system. Using GIS and interactive internet mapping capabilities, the County should establish a method of effective coordination between key agencies that own, manage and maintain components of the Transportation Trail Network. This will include the VDOT, FCDOT, NVRPA, Fairfax County Park Authority, the National Park Service, the Fairfax County Department of Public Works and Services, the Fairfax County Public Schools, private property owners, Home Owner Associations, and potentially others. 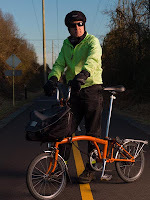 Fairfax County, VDOT and other key agencies/entities that own and manage Transportation Trails should establish dedicated funding for annual maintenance of Transportation Trails in the Bicycle Network; VDOT and FCDOT should establish dedicated funding for maintenance of on-road bicycle facilities. By 2015, periodic bicycle lane and shoulder sweeping should be a routine VDOT maintenance activity. Clean up activities after car crashes must leave the road safe for cyclists. Bike facilities as part of resurfacing, using 2% funds to create 3 foot minimum shoulders, preferably 4 feet or greater. Use of 10 foot wide lanes on roads with speed limit of 35mph or less. Value engineering should not be used to degrade or remove bicycle facilities in the plan. Provide a minimum staff of three full-time employees. Provide a minimum $500,000 annual budget for planning and programmatic and small scale capital projects such as: installation of bicycle parking racks and lockers, signs for signed bicycle routes, curb ramps, and small bicycle access and trail access projects. Establish a permanent Countywide Bicycle Advisory Committee that reports to the Board of Supervisors through the Transportation Advisory Commission (TAC). Reform the Trails and Sidewalks Committee as a Pedestrian Advisory Committee under the TAC. If needed, create a Recreational Trails Committee under the Fairfax Park Authority to address issues and needs related to equestrian trails, mountain biking, hiking and other issues pertaining to Non-Transportation Trails. Charge the Bicycle Program with bicycle transportation tasks related to the following: on-road and off-road bicycle facility engineering and design, bicycle parking, bicycle-related coordination with VDOT, bikeway capital project management, interagency and intergovernmental coordination, development review, bicycle counts, data management and program evaluation, and staff liaison with Bike Fairfax. Bike Parking Guidelines recently developed by the Fairfax County Bike Program are considered to be the standard by which to decide and judge the quantity and quality of bike parking to be provided. Delegate primary leadership for encouragement and education programs to a new Bike Fairfax program (discussed below). Provide bicycle commuting support and information to employers and employees. Promote bicycling for non-commute trips. Coordinate and host countywide bicycle encouragement events, such as those during Bike to Work Month, regional Bike to Work Day, etc. Organize local bike promotion events with shopping centers, large employers, health care institutions and agencies, special events, festivals, the Fairfax County Park Authority. Promote the bicycle parking installation program. Coordinate with the Towns and Cities within Fairfax County, as well as other institutions such as the Department of Defense, National Park Service, and other Fairfax County government agencies to promote biking as a safe and reliable transportation choice in the County. Organize and offer classes that teach hands-on bicycling skills and rules of the road to a wide variety of constituencies within the county. Be a clearinghouse for skills and safety education training opportunities offered by other programs in the county. Provide a website and serve as a source of bicycle-related news and events. Work with law enforcement, State and County elected officials and advocacy groups to enact changes in law or policy at the State and County levels that would clarify code language relating to right-of-way on public facilities. To ensure a common understanding of laws related to bicycling and right of way on public facilities, and the consistent and fair enforcement of these laws, prepare clarifying communications for the law enforcement community, VDOT and FCDOT traffic engineers, cyclists, motorists, and judges. Improve training of law enforcement officers to ensure equal and fair treatment of bicyclists with regard to traffic law enforcement, crash reporting and fault finding. Coordinate road and trail design and enforcement practices to ensure consistency in the application of bicycle and trail safety treatments and infrastructure design. Always include education with enforcement to achieve the greatest impact with the intended audience. Implement Fairfax County’s bike safety education curriculum in all Elementary Schools, the State’s curriculum, BikeSmart in Middle schools and bicycle safety education in P.E. in the High Schools. To assist with school based education, restore the budget for School Resource Officers (SROs) and School Education Officers (SEOs). Work with the DMV to update the Virginia Driver Education curriculum to include bicycling. Driver’s education programs in public schools are required to use VA DMV curriculum which does not effectively address sharing the road with cyclists. Focus public education campaigns on the issues surrounding motorists and bicyclists sharing of the road and participate fully in the regional Street Smarts Campaign, which coordinates education and enforcement efforts relative to bicycle, pedestrian and motorist safety. In conjunction with the Northern Virginia Regional Park Authority (NVRPA) and Fairfax Park Authority conduct a trail user and motorist education campaign related to safety at trail/roadway crossings, and other trail safety issues. Track and report the annual number bicyclist injuries in Fairfax County, the annual number of bicyclist fatalities in Fairfax County, the annual number of programs or classes hosted in Fairfax County to address bicycle safety education, and the number of schools in Fairfax County teaching bicycle safety education. Provide high quality bicycle parking at all school facilities. Make spot improvements on school properties to improve bike access to and through school grounds; prioritize other bicycle infrastructure improvements near middle and high schools as those schools develop interest in promoting biking to the school. Continue expansion and institutionalization of the bicycling component of safe routes to school activities for all schools in the system, K-12; address bike safety education, encouragement, enforcement, engineering and program evaluation. The County must establish dedicated funding for Bicycle Network development and program implementation. Funding and programming for development of bicycle facilities should be simplified and made transparent in order for performance measures for spending and program utilization to be established and monitored through public oversight. Funding for encouragement and safety education should be derived from employer contributions to TDM programs, partner organizations, and CMAQ funds. Fairfax County will consider funding stand alone projects to address bicycle safety and facility discontinuity resulting from intermittent redevelopment of roadside property. By 2020, reduce bicycle crash and fatality rates by increasing the numbers of people bicycling and maintaining or reducing the total number of crashes and fatalities involving bicyclists. To track the rate of Plan implementation, keep the public informed on Plan progress, and report the benefits of the overall Plan to Fairfax County, an annual Bicycle Master Plan performance tracking program is needed. The Bicycle Master Plan recommends the following count program to both establish a baseline assessment of bicycle activity in Fairfax County, and to track on an annual basis the implementation and performance of the Plan. FCDOT shall establish an annual bicycle count program using a methodology focused on select locations throughout the County where significant bicycle trip activity is already present. FCDOT should expand the bicycle count program annually to additional locations as the physical network is expanded and use automatic counters in high-volume locations. Utilize WMATA’s bicycles-at-rail station census and bicycle and pedestrian access needs assessment database to count bicycle activity and ensure adequate bicycle parking capacity and quality of service at Metrorail stations in Fairfax County, including the new Silver Line stations as they open. Coordinate with the Transportation Planning Board to enhance future regional travel surveys to better account for bicycle travel. In order to meet the vision identified in this Plan, the County will need to invest resources in bicycling as it does with all other transportation modes. An annual budget allocation will enable the County to build more bicycle facilities, create longer linear connections of on and off-road facilities, and better maintain those that already exist. Resources are also required to support encouragement and safety education programs that will capitalize on building momentum while increasing the safety of both bicyclists and drivers who will be interacting with greater frequency in the coming years. Without a consistent investment in bicycling, there should be no expectation of more than the slow progress that the County has seen over the last two decades. However, with greater investment and a commitment to getting the details right, the County will see faster and more visible progress. This will increase safety, enhance quality of life, and support economic competitiveness, which will benefit everyone in Fairfax County today and in future generations.